Welcome to the Aquablast Corp. web site. Since 1973, Aquablast Corp. and its fleet of green trucks have been providing water blasting ( or water jetting) services, as well as wet and dry vacuum (or hydrovac) services to a wide range of industries and a great number of businesses throughout the GTA and provincial region. 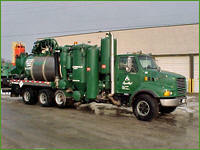 Hydro-excavation exposes a utility or removes earth in close proximity to a utility. An example of exposing the utility would be daylighting or potholing a gas main to determine its exact vertical and horizontal position. Another use of hydro-excavation would be an excavation for a pole installation that is within one meter of an existing utility. When excavating in the proximity of buried utilities, hydro-excavation is a safe alternative to hydraulic methods and an efficient alternative to hand digging.